The Hall of Hands Studio automatically collects your online played hands. 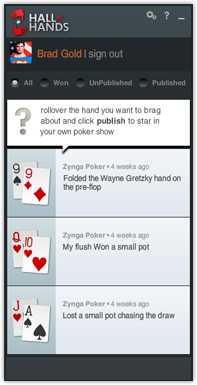 A list of all your hands will be displayed in the Hall of Hands Studio, indicating the pocket cards dealt and a short	summary of what happened during the hand. You can scroll through the list to select the hand you want to turn into a poker TV show and share with the world.